Hi all! I’m new to this site but I’m told this is where I can upload crosswords? Here’s one I’ve written. I’d be very grateful to get your comments / brickbats. Welcome to the forum Deuce – but you’re no stranger to the field of amateur setters, having been hosted by both Alberich and BD! This is a much quieter domain than BD, you’ll find. Nice to get so many theme words in, but my criticism would be, we’ve seen this theme used several times in recent months, after a while it gets a bit ‘samey’. Moreover you do need to have just a modicum of GK. Not being a “1ac”, I puzzled for a while over 28a until it sprang out at me. Excellent wordplay that last one, btw! Others I like are 5a, 18a, 20a, 25a, 4d (for surface), 5d (I was trying to fit in [c]AT without any luck! ), 14d, 16d (assuming one’s well up on the theme!). Now the nit-picks. I wondered a while about 23a, needed a Chambers look-up but it’s there, albeit marked (obsolete), so it’ll pass, I reckon! Am dubious about the definition in 13a, don’t see how ‘bore’ comes into it – unless I’m missing something obvious. Likewise in 1d where I’m not sure about ‘charges’. For 12a there’s a word I had to look up – though it rang a bell somewhere – something in one of the James Bond films wasn’t it? 21d I can’t see the ‘imperial unit’ bit. 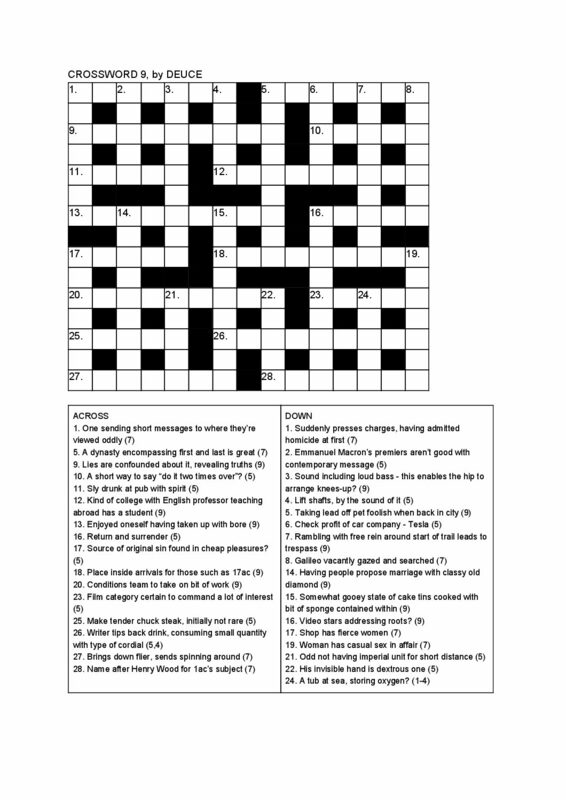 Anyway well done for an enjoyable puzzle – my gripes-count is no more than I’d have for a typical Grauniad one! Look forward to more from this quarter! Many thanks, Deuce, and welcome to this forum! I thought this was a fine puzzle with several smooth surfaces and witty devices. The theme isn’t so well-worn in my experience as Laccaria found it, so it was a pleasant discovery for me. No quibbles from me on 13a or 21d (on which, in a sense, Laccaria speaks better than he knows! ), and the Concise Oxford supports the synonym for ‘charges’ in 1d. By elimination I believe I have the answer for 22d, which I haven’t yet justified from the wordplay. You’ve come up with a service winner; will your nom de guerre be Advantage next time?! Thanks, Deuce. This went down well with a breakfast cuppa earlier this morning. I enjoyed the surfaces and the wordplay. I wondered a bit about the definition in 17d but I think it works. J’accuse Laccaria of misdirection in relation to 26a! Like both Trigon and Laccaria I am still in the dark over 22d, although I too have an answer by elimination. Dear all, many thanks for the feedback! And I’m glad you enjoyed it. Sorry you’re all stuck on 22d! It is a double definition, for which one entry is a regular word in Chambers, and the other is a proper name which requires a bit of GK – though you should be able to find if you 8dn the operative bit of the definition. Ok. I 8d as suggested and now think it an excellent clue! Thanks for the tip Deuce – all done now! Once I’d got 22d in, 26a sprang out at me instantly (this so often happens when solving)! I was on a false trail for ages on that one, trying to put in SODA as the second word! But I still don’t quite get the parsing of 26a – I’ll wait until you post the solution. Keep the name “Deuce” – it’s a good handle and one to remember! It occurs to me (being a bridge-player) that, besides its meaning in tennis, a ‘deuce’ is also an old name for the Two in a pack of cards. But I’ve never heard anyone use that word during play (a few more senior players still refer to the Jack as the “Knave” though….) This sort of useless wisdom might come in useful, one day, to setters! Always hard to know who counts as famous / well-known – but he was on the 20 pound note! Will you be uploading a solution to your puzzle, and if so, when? I would like to try it but I have a policy of not starting puzzles until I know I will be able to get the answers if completely stuck. Printed this out to have a crack at it today. Will report back! I am a recent subscriber to this site, and have been working through the “Your Puzzles” section to gauge the standard before uploading a puzzle or two of my own. I very much enjoyed your puzle, thank you, and I managed to complete just over half of it (largely the right-hand side) without too much trouble before having an enforced break. I returned to complete the puzzle this morning, which went reasonably well once I got 13 and 20 in place. Having read the comments from other solvers above, may I add the following observations? 20 I wondered if “bit” is possibly superfluous, or do you feel “work” on its own is insufficient to point to “erg”? 26 Like some other contributers, the “cordial” bit had me stumped. I was thinking of Kia Ora at first, already having the O and A in place! I presume this is a reference to “cola”, but I’m not sure how it fits in total? 28 I believe some solvers would not approve of the false capitalisation of “Wood”? It did throw me for a little while, not helped by the fact that I did not have 1a completed at the time. 17 I wasn’t sure about the use of “Shop” – I would think “Store” might possibly be marginally better? 21 I didn’t understand this one, I’m fraid. 22 I didn’t get the Adam Smith quote – it is nearly 40 years since I took my A-level in Economics! Personally, however, I am quite used to having to Google references in subject areas I am not familiar with, so I don’t see this as a problem. 24 As very much a newcomer, I was a little puzzled by the overlap of wordplay and definition in this clue, as I found myself lacking a clear definition to aim at. Perhaps a more experienced solver might explain in what circumstances this is accepatable? Again, many thanks for an enjoyable puzzle. Very glad you enjoyed it, Phil! And thanks for the trouble to provide your thoughts. 20ac: “bit” as in “unit” of work, or “small amount”. But, yes, it probably works without. 28: I normally use the rule that false capitalisation is acceptable, but false uncapitalisation is not (following the norms set out e.g. here: http://www.crosswordunclued.com/2009/11/false-capitalization.html). Would be interested to know how others feel – it is a tad tricksy. 22. Indeed a bit obscure as others have noticed. 24. Intended to be an &lit clue, although not the world’s finest. Deuce, I’m still waiting for the solution to come available before trying this one, but read Vanellus’ comments having forgotten I haven’t done it. For the record (without rereading crosswordunclued), I believe that false capitalisation is always acceptable, but false decapitalisation (sic) is unacceptable to Ximeneans and others under their influence. There’ll be a slip about it somewhere on http://www.andlit.org.uk/azed/slip_search.php probably. @Phil / Vanellus, I look forward to hearing you’ve tried my puzzle here and to having a go at one of yours when it goes up. Many thanks for your responses, Deuce and Whynot, I have followed the individual clue solutions through and can now see what I was missing! I’m still trying to fully understand the “&lit” concept, but I’m sure it will become clearer with experience. I have made a few tweaks to the puzzle I was intending to post, so I just need to give it a final check and hopefully I should be ready to upload in the next day or so.